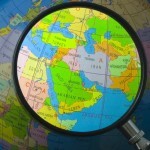 INSCT’s Program on Security in the Middle East is a multi-part, international, interdisciplinary initiative that takes a cross-cultural approach toward understanding the historical and religious complexities; the political, economic, and social challenges; and the legal, policy, and military realities that impact the region. The initiative’s mix of legal and social science research, immersive educational opportunities, and dialogue fostered through seminars and speaker series benefits students, academics, and practitioners alike. Law and graduate students engage with the issues via interdisciplinary coursework, simulations and practicums, and study abroad at INSCT partner institutions in Israel and Palestine. To promote greater cross-cultural understanding and an insight by renowned experts as to the complexities facing the region, INSCT hosts this speaker series on the Syracuse University campus. 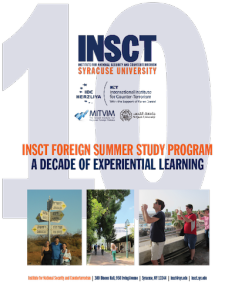 Read about INSCT’s “Decade of Excellence” in experiential learning in the Middle East. INSCT’s Program on Security in the Middle East is supported by alumni and friends who share the belief that facilitating direct student engagement with scholars, practitioners, and experts with first-hand experience of the complex issues facing the Middle East is the best way to create effective leaders. SU alumnus, trustee, and INSCT supporter Gerald B. Cramer (‘52) first assisted INSCT’s work on Security in the Middle East in 2005 by sponsoring an exchange program that provided SU graduate students the opportunity to study at the Interdisciplinary Centre’s International Institute for Counterterrorism (ICT) in Herzliya, Israel. SU alumna Carol Becker (‘76) showed her deep commitment to fostering dialogue and improving security in the Middle East with contributions, beginning in 2010, which have helped to expand the program by sponsoring a speaker series and offering additional study abroad fellowships. Additional support has been provided by SU alumni Carol Zeiger Raff and Harvey Raff (both class of ’54).